Discussion in 'Other' started by jefcam, Nov 12, 2016. Louis, ede78, Corti and 7 others like this. Is it possible to know the details? Because I use the previous version, I I prefer to know what is update before installing over it. Is there Left Side / Right Side is still present and unmodfied? Trust me use this version. The event you mentioned for Left Side / Right Side is the same, only changed some parameters in event properties not to repeat too much when surrounded by lots of car. It works better. Then for example removed the event=minordamage as this did not work as planned, with event=hit which now spotter asks how the driver is when hitting wall/car/object at high speed. Basically to check if he is ok.
New event for safety car out by my friend 'The Lead Wolf'. Now spotter will inform you of all the phases of the safety car example when pits are open, when it's the last lap etc. During qualify and practice for every sector you will be notified of gap even from 1 sec to 10 seconds, faster or slower. During race if in sectors you go over the 5 seconds, that means you're going slow so spotter will advice to push harder. Some of the sounds were re-recorded to sound better and new sounds introduced. Fine tuned some events not to work during safety car. Event=Penalty has a missing sound. Wiggin and Ernie like this. Congratulations on the release, Jeff! Tested, it's a great job, the only thing to try to improve it's the contact sentences, when there is a little contact, the guys tell you if all is ok, it's not a crash, and the sentence is repetitive. You got a contact it's perhaps more appropriate? I am not happy with how this hit event works. it works with speed. so for example if you hit another driver at high speed but no crash, just push, the spotter says 'are you alright'. not so good. Where do I place this file? +1 does it go in the plugins folder?????? Has anyone tried spotter to see if it works with the latest dx11 patch? Spotter has to do with sound and should work but better ask. I have not yet installed the new upgrade as some plugins were reported not working such as trackmapplugin. Seems to work if you don't use the "radar" feature included with this plugin. - new events (for example two of them will be to be alerted of the time gap between you and the driver in front and driver behind. Mulero, ebeninca and Ernie like this. Will delay the release by a couple of days for further testing. Fixed the errors of the previous release. I am very happy with new release...! yashiman, ebeninca and The Iron Wolf like this. 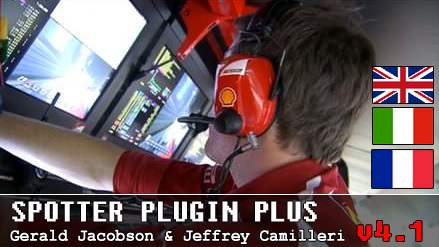 Who uses spotter plugin by Gerald Jacobson + my sound pack including the additional events? I need a person who uses this spotter to give me some feedback how the new version 3.0 will work. Before I worked with a friend of mine 'The Iron Wolf' but now he has shifted to CC. I have been using your soundpack for a year already, I do not intend to change to the crew chief. I did not offered myself to test yet because my english is not good, since nobody appeared here, I can try to give a feedback in case you still need it. New Version 3.0... check first post of this thread. ebeninca, Corti and Mulero like this. Great job Jefcam, working Fine. In the previous version i had to change the tires and brakes temperature threshold, in this version it's fine out of the box. Another thing is the volume, in my pc i had to edit the ini file and set all to 2.0. probably something with my soundcard. Can you please explain more this problem? did not understand you. The spotter sound is too lower compare to the engine, changing the engine volume to max, and reducing spotter volume don't help. I had to double the spotter volume in config files.